I checked everything, mags, ramp etc..had zero malfs, really odd. Unless I got a sour grape in the bunch case wise or the copper plate is getting scraped off the bulet I'm kinda stumped? Myabe my crimp is too wide or too narrow, there's a burr I cant find in a mag, hmmm..? I'm gonna keep an eye on this and go back over everything tonight with a microsope...not sure what the cause was, never seen this before so. The gun's psyco and runs on anything and it's only stopped once when a 5$ no-name mag fell apart, sucker 'll work in mud and sand so it really dont care what gets in the feed zone....but it's got my couriosity piqued. Barrel hood corners were kinda sharp, so I laid them over a tick with a smooth diamond dust file. Slide stop has a small burr from the mag follower slamming it. Same treatment. Micro-lay over. Stuffed a round in the chamber (barrel off) and rolled it firmly, this and that....chamber picks up 'some' brass off the case, but, it feels nice and smooth- steels harder than brass so duh! Stuck a mag in the well with some rounds in it (with the slide and barrel off ) looking for stuff dragging on brass and only thing that comes close is the slide stop lobe. Other than that things look good for this old Horse. So if yer gettting dusted by your brass check these two out for a possible hang-nail. Kindly avert yer eye's, the Col's Nekid!!! Wow, lots of parts! Are the new mags exactly the same length? I guy at the range this morning with a new Remington 1911 bought some Kimber magazines. The new mags were slightly shorter and did not feed properly. Just curious, since the cartridge oal is ok, but how about the brass trim to length? You can have a cartridge oal which is within specs but still have a brass shell that is to long. Mags- spot on, never a malf. Case lentgh varies...but within spec. post size based on random samples. Good point, left that out oops. As said, they are new once fired, never reloaded twice so...but unless I check them all yer right, a case can be too long. On a super tight gun and way over t/t lenthgh it'll def cause a lot of issues. This thing's pretty loose but still accurate...go figure. Glad I tore it down, been a spell since last detail strip. Sear and such was pretty yuky. Poor thing gets worked hard sometimes. Yeh- usually only the slide/barrel comes off for field strip. Tell yer buddy to try some Wilson Combat mags or McCormick power mags. I use both and swear by them- ZERO malfs with mixed loads in the mags including snap-caps for clearing drills. Wilson's get the nod first as the follower is polymer. If he's shooting relaods make sure his OAL is long enough. Most FTF are from too short of rounds. Weak mag springs are next. Never seen a too short of mag before, that's weird! Just curious, since the cartridge oal is ok, but how about the brass trim to length? Ya know I was dwelling on this point last night. I sized/decapped a bunch of cases. Started mic'n them. Most were on the limit, a lot were over by a thou or two. I grabbed my Colt, took off the slide, stuffed a round in the chamber to see if it protruded past the hood- nope, flush or below. Actually looks good. 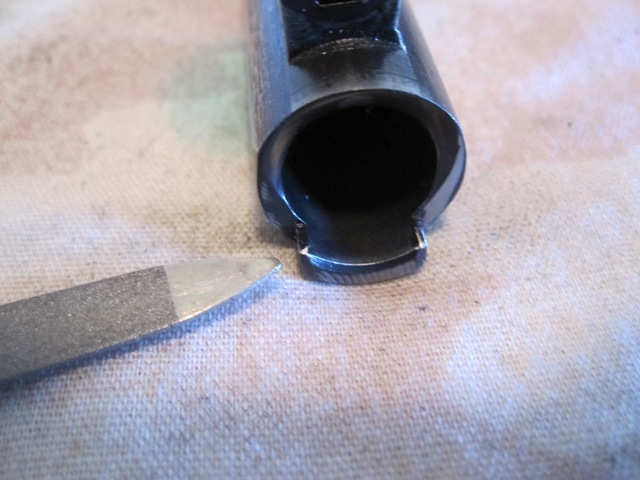 Then I flipped the slide and inserted the barrel (warning- you now have a live round in the chamber and are closing in on the pin- even if the slide is off the frame) and carefuly snicked it home past the extractor to get the lugs to lock up. I did this to see how much room I had when the round was centered home in the chamber, the breech face and the slide/barrel lugs were locked. There's a bunch. So I don't have to worry about slam-fires, stuck cases, busted extractors etc. As said, this gun is loose- for a lot of reasons. But- like they say- complaisance is kaboom. Reloading aint something I'm supposed to be taking shortcuts with- I dont with high-power or revolver stuff so.... I should mic them all. Good point Omni. Very interesting! Ok, Omni, decapped/sized, trimmed and deburred 5 boxes last night. Hands are kinda sore...hope yer happy. Kidding. Darn near every case was over by a thou or two in this batch, some were 3thou over...doubt it's hurting anything so... but now were good to go so there'll never be an issue. Kinda sad these wont be picked up by me, my gun flings them forward on the staic range and outdoors or drilling they get stomped on and swept up so...unless I'm shooting static outdoors on my own bye-bye nice trimmed brass. Glad I got a Lyman universal trimmer too, Big Orange earned it's keep...got a power chuck for it but I can trim'em by hand-crank just as fast....oof I'm pooped. Glad to hear you found something at least, makes the effort worth while when you find something. Now the real test will be when you fire them reloads and inspect the gun after. Copy that! Aint worried either way. Only things I'm worried about are squibs during fast pairs/three's or -a double-charge...and I inspect EVERY charge before I cap it with a bullet. Get a work out too, just before it gets a bullet I stand up off my stool and take a peek with my light...kinda like doing squats...roomy thinks im nuts. I say I'm saving money and getting in shape. Maybe the gun 'll be happier, I dunnow...it was happy before so...but, yer point was well taken and now everything is right, as it should be. Yup, and what I do on all my reloads is to take a cartridge after the dump of powder and a visual is to then set it on my loading block and plop a bullet on top. I dont use blocks. Never have. But- agreed! Drop a cahrge stuff a bullet on it! For rile the bullet is seated after the powder goes in. A case is not allowed to have any powder it in, or be mouth up for that matter, unless it has a bullet seated in it. I see guys with all them cases lined up, case mouths open, charges in...yikes!!! Makes me nervous. 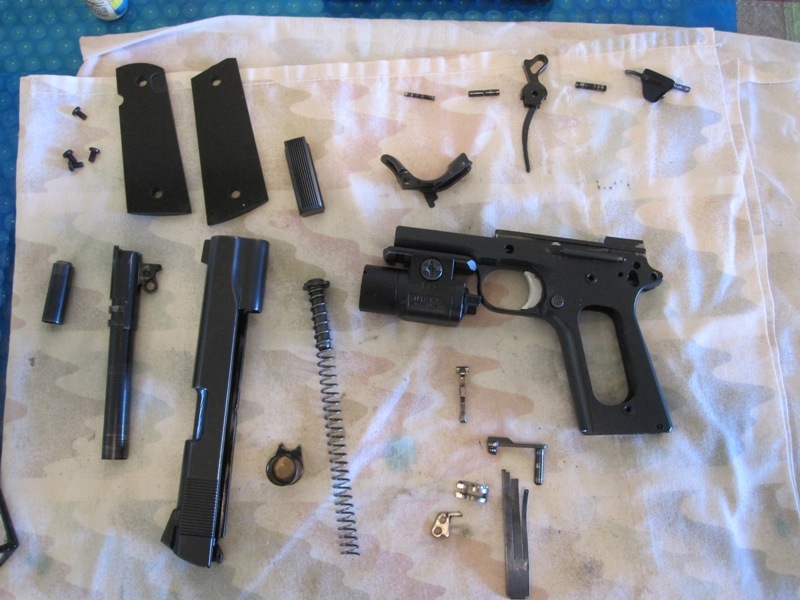 Fer pistol I go full progressive for plinkers that dont shred cases, they get trimmed once then checked every other loading and usually only grow once or twice then that's it if I keep them soft. If anything with the trimmed cases I bet my consistency/pattern will tighten up some...now ya got me curious. Now I wanna go shoot it! Honestly, I aint braggin' cus I didnt "make" this pistol Colt did, but the sucker makes nice little groups if I try for how "sloppy" (as some put it cuz they think a 45 has to be squeaky tight) it is...guess I'm happy to have gotten a good one. Really like this gun, how it turned out with the bolt-on's I did, the dehorn, bead blast and bluing and as stated Im gonna start treating it nicer it's had a rough life and wanna get a Glock to take some of the burnedn...nothing last as long as them or takes quite the beating and if I get it from Davisdsons and it breaks big deal! I figure those auto pistol cartridges headspace on the case mouth so that dimension always needs to be the same for consistency's sake. Otherwise, even with a completely consistent OAL your distance from bullet to lands will be varying. It would be like a bottle neck cartridge with the shoulder dimension wandering around. Agreed. And we're talking .002"-.003" max diff. Not sure if this pistol is that sensative...could be. OAL determines feeding. A lot of pistols will simply not feed or chamber if the round is too short. And it dont take much. 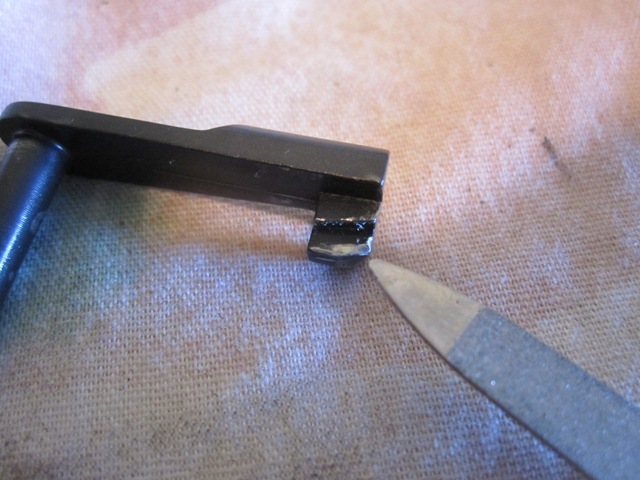 I was more concerned with it not going into battery or the extractor not clipping over the rim. I've measured a lot of cases. This last lot of brass is all over the place pre-size. Post size it's worse, naturally. So I guess I may have stopped and issue before it started.